Motto: Faith, foresight, and industry. 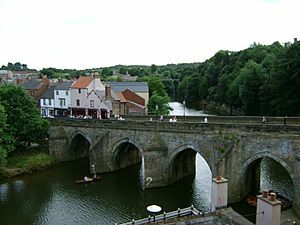 Durham (/ˈdʌrəm/, locally /ˈdɜːrəm/) is a historic city and the county town of County Durham in North East England. 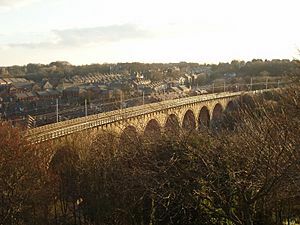 The city lies on the River Wear, to the west of Sunderland, south of Newcastle upon Tyne and to the north of Darlington. Founded over the final resting place of St Cuthbert, its Norman cathedral became a centre of pilgrimage in medieval England. The cathedral and adjacent 11th-century castle were designated a World Heritage Site by UNESCO in 1986. The castle has been the home of Durham University since 1832. HM Prison Durham is also located close to the city centre. 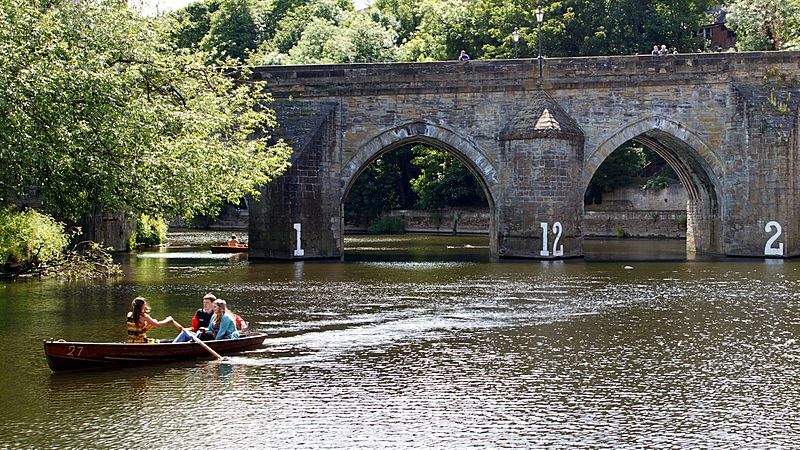 Durham's geographical position has always given it an important place in the defence of England against the Scots. 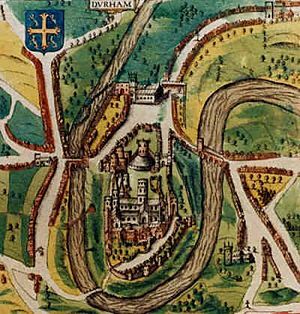 The city played an important part in the defence of the north, and Durham Castle is the only Norman castle keep never to have suffered a breach. The Battle of Neville's Cross, which took place near the city on 17 October 1346 between the English and Scots, is the most famous battle of the age. Owing to the divine providence evidenced in the city's legendary founding, the Bishop of Durham has always enjoyed the title "Bishop by Divine Providence" as opposed to other bishops, who are "Bishop by Divine Permission". 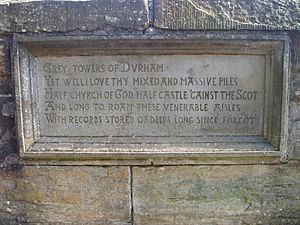 However, as the north-east of England lay so far from Westminster, the bishops of Durham enjoyed extraordinary powers such as the ability to hold their own parliament, raise their own armies, appoint their own sheriffs and Justices, administer their own laws, levy taxes and customs duties, create fairs and markets, issue charters, salvage shipwrecks, collect revenue from mines, administer the forests and mint their own coins. So far-reaching were the bishop's powers that the steward of Bishop Antony Bek commented in 1299 AD: "There are two kings in England, namely the Lord King of England, wearing a crown in sign of his regality and the Lord Bishop of Durham wearing a mitre in place of a crown, in sign of his regality in the diocese of Durham". All this activity was administered from the castle and buildings surrounding the Palace Green. Many of the original buildings associated with these functions of the county palatine survive on the peninsula. 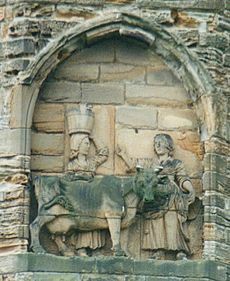 Every Bishop of Durham from 1071 to 1836 was a Prince Bishop except for the first Norman appointment, Bishop Walcher (in office ca. 1071-1080), who was styled an Earl-Bishop. Although the term "prince bishop" has been used as a helpful tool in the understanding the functions of the Bishops of Durham it is not a title they would have recognised. 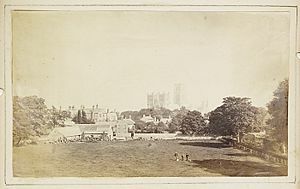 The last Prince Bishop of Durham, Bishop William Van Mildert, is credited with the foundation of Durham University in 1832. Henry VIII curtailed some of the Prince-Bishop's powers and, in 1538, ordered the destruction of the shrine of Saint Cuthbert. The Prince Bishops also had their own court system, most notably the Court of Chancery of the County Palatine of Durham and Sadberge. The county also had its own attorney general, whose authority to bring an indictment for criminal matters was tested by central government in the case of R v Mary Ann Cotton (1873). Certain courts and judicial posts for the county were abolished by the Supreme Court of Judicature Act 1873. 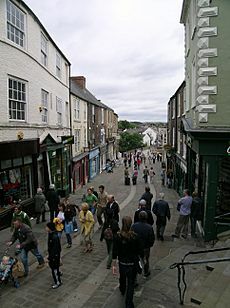 Others were abolished by section 2 of the Durham (County Palatine) Act 1836 and section 41 of the Courts Act 1971.
stated he escaped down the Bailey and through Old Elvet. Another local legend has it that Cromwell stayed in a room in the present Royal County Hotel on Old Elvet during the civil war. The room is reputed to be haunted by his ghost. Durham suffered greatly during the civil war and Commonwealth. This was not due to direct assault by Cromwell but the abolition of the Church of England and the closure of religious institutions pertaining to it. The city has always relied upon the Dean and Chapter and cathedral as an economic force. 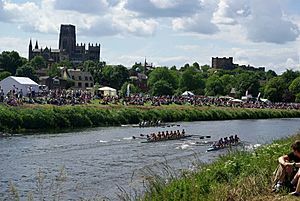 The 19th century also saw the founding of Durham University thanks to the benevolence of Bishop William Van Mildert and the Chapter in 1832. 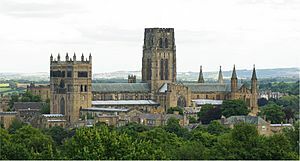 Durham Castle became the first college (University College, Durham) and the bishop moved to Auckland Castle as his only residence in the county. During the 20th century the University expanded greatly. 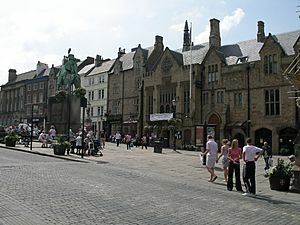 St John's College and St Cuthbert's Society were founded on the Bailey, completing the series of colleges in that area of the city. From the early 1950s to early 1970s the university expanded to the south of the city centre. Trevelyan, Van Mildert, Collingwood, and Grey colleges were established, and new buildings for St Aidan's and St Mary's colleges for women, formerly housed on the Bailey, were created. 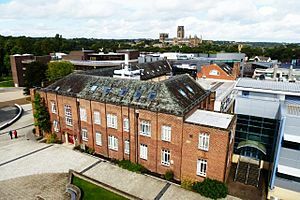 The final 20th century collegiate addition came from the merger of the independent nineteenth-century colleges of the Venerable Bede and St Hild, which joined the university in 1979 as the College of St Hild and St Bede. The 1960s and 70s also saw building on New Elvet. Dunelm House for the use of the students' union was built first, followed by Elvet Riverside, containing lecture theatres and staff offices. To the southeast of the city centre sports facilities were built at Maiden Castle, adjacent to the Iron Age fort of the same name, and the Mountjoy site was developed, starting in 1924, eventually containing the university library, administrative buildings, and facilities for the Faculty of Science. It remained the Bishop's Palace for the Bishops of Durham until the Bishop William Van Mildert made Bishop Auckland their primary residence. 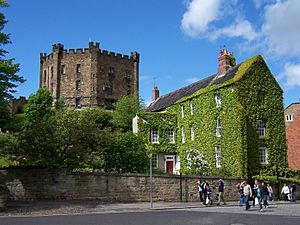 A founder of Durham University, Van Mildert gave the castle as accommodation for the institution's first college, University College. The castle was famed for its vast Great Hall, created by Bishop Antony Bek in the early 14th century. It was the largest great hall in Britain until Bishop Richard Foxe shortened it at the end of the 15th century. However, it is still 46 feet high and over 33 yards long. The castle is still the home of University College, Durham (which is, as a result, known informally as "Castle"). It has been in continuous use for over 900 years and is the only castle in the United Kingdom never to have suffered a breach. Durham County Council operate a bus-based park and ride service to the city centre from three sites on the periphery of the city. The service operates every 10 minutes Monday to Saturday between 7am and 7pm. Durham bus station serves the city of Durham. 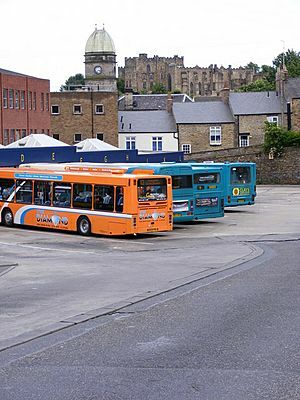 The bus station is managed by Durham County Council. There are 11 stands and the main operators from the bus station are Go North East, Arriva North East,Scarlet Band, Stanley Travel, Weardale Motor Services and National Express. 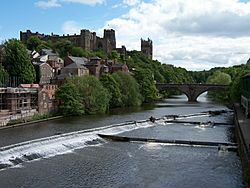 Durham, England Facts for Kids. Kiddle Encyclopedia.